Video Game Giveaway: Enter to Win Wipeout 3 for Xbox Kinect! I had the wonderful opportunity to attend the Activision Family Game Summit this week to learn about the latest Activision video games for families. I learned about some of the games already on my girls’ wishlists--and was able to add a few to those lists with a little more confidence. I would like to share a few of the things I learned about Activision and video game ratings--and video game benefits with you. I would also love to give you a gift as well. We are giving away one copy of Activision’s Wipeout 3 for Xbox with Kinect just in time for Christmas, so be sure to enter the Rafflecopter giveaway at the end of this post! There are family friendly video games that suit both parents and kids. There are lots of suitable, family video games available--that the kids actually want. As parents, we just need to do our homework. Angry Birds is a collective favorite game for my cellphone. All three of the girls love it--and it is now available as a video game in Angry Birds Trilogy . As the mom of three girls, it was once a little difficult to find games geared toward young daughters. This is no longer the case--games featuring Lalaloopsy and other well known characters make choosing games for girls much easier. While mature themed games may still make it onto your child’s holiday list--there is likely a number of family friendly video games on those lists as well. The ESRB Rating System offers more than just letter ratings. I think most of us understand the video game rating system and are familiar with the letters. Those of us with little ones know to look for those games bearing an E for Everyone symbol. I was not aware that the new ESRB RatingSystem includes a 3-part system that offers a lot of information and insights into a game’s rating. The Interactive Elements portion of the rating helps parents understand more about information sharing--and that really helps those of us seeking to protect our children’s online presences. Research shows benefits of video games. While I am a proponent of outdoor, face to face playtime for my girls--the occasional video game may not be so bad. Research presented during the Activision Family Game Summit reminded us that there are benefits to video games--when chosen to suit our personal needs and values and when played as a family. I learned a lot from the Activision Family Game Summit and I hope that I gave you a few resources as you make your child’s video game purchases this holiday season. Time to Enter our Wipeout 3 for Xbox 360 Kinect Video Game Giveaway. Now--how about winning a free video game to get your holiday shopping up and running before Black Friday? I received a goody bag from Activision for attending the Activision Family Game Summit--and wanted to share a gift with one lucky reader! 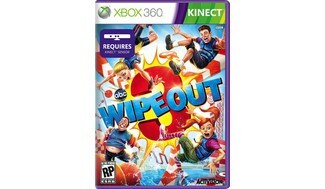 We are giving away one copy of the Wipeout 3 for Xbox 360 Kinect video game!!! Enter via the Rafflecopter entry below and leave us a comment and tell us what gift tops your child’s wishlist this year! ! The contest ends December 3rd. Good Luck!! New follower from the Thumping Thursday hop, would love for you to come by and follow back? they are only 2 and 3 so they basically want every toy that they see on the commercials. all my 10 year old girl wants is xbox kinect games! all of them! yeekers! thanks for the giveaway!! My daughter wants a Nintendo 3DS for Christmas. Xbox 360 or playstation we have one xbox 360 now but with 3 boys 18,13,12 ITS CRAZY HERE! My granddaughter wants a iPad. My nephew wants the new ipad mini. I hope to win one for him! My daughter wants some legos. My kids wanted an xbox for Christmas so just bought one and hid it in the basement. It also came with a Kinect, so this game would be great to go with it! Wipeout 3 for XBox will be an amazing addition to Christmas for the kids! my son wants more video games. Definitely an XBox 360 is at the top of my list. We have games and no console for us to play them on. A Purple Furbee.Thanks for the chance. My 13 year old son wants a metal detector. My son wants a swingset, or a bike. My sons really want peace throughout the world. MINE AREN'T SELFISH. My daughter wants a kitchen set so badly! My daughter is a senior in h.s.--and gift cards rule her list this year too! a new TV--one that isn't a thick box one! He wants LEGOS and Hot Wheels! my kids would love wipe out !!!!!!! My daughter loves anything My Little Pony right now. My girls want one too...attached to a karaoke machine and a library of karaoke cds. Isn't that the truth! :) Mine too. New Wii U? Of course, Mom! Doesn't matter if we just got iPod something-or-others, does it! My 11 year old forgetful child would like an iphone. Right???? any and all video games!!!! My teen wants a kindle fire hd. They want a XBOX 360, this would be the perfect companion present. At the top of my kids list is epic mickey 2 and an xbox360 for their room. My kids all want Kindle Fires - even the 4 year old!